For most girls who have deeper skin tones, we often look around for dark lip shades to line and apply on the lips. This is not only because these colors compliment our skin-tone well but also because they make any makeup look that we wear rather fabulous and mysterious at the same time. 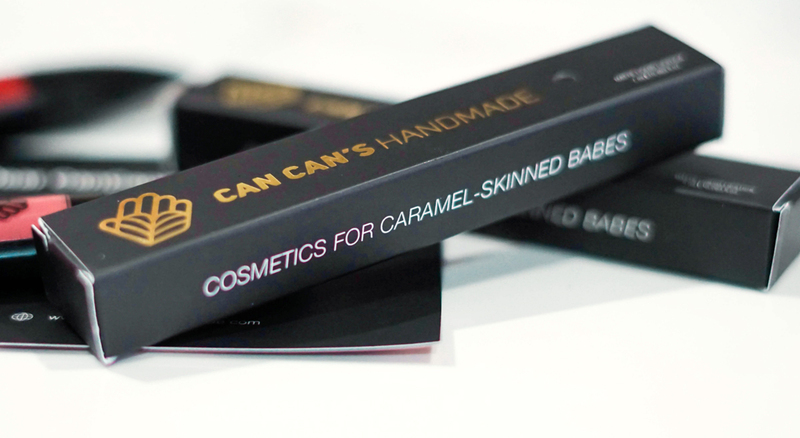 Now in terms of drugstore products, I often go towards Lakme and Revlon, because their color tone matches extremely well to my skin (Lakme has great pencil liners), but recently something else came to my attention and this was from Can Can's Handmade which on its online header states its for the 'Caramel Skinned Babe'. Nonetheless seeing that just about every shade in the beauty industry can be worn by anyone based on preference, this brand got me a little curious. Did this mean that deeper skin toned girls could find a great color match for a matte lip? Well, taking a look at their website, it would apparently seem so. However, I was a little disappointed to see that in terms of the range, the shades were only limited to two (3 including Shameless), so that wouldn't be much to work with but nonetheless, let's see how the colors fare. The first one up that pulled my interest was this dusty rose/mauve shade called Muse. 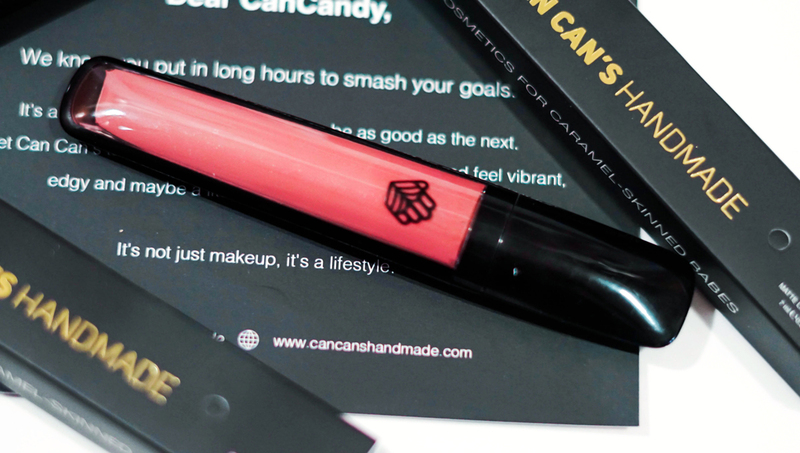 It comes in an all ultralight matte vegan formula, has pink undertones and compliments well to any natural lip tone - whether it be fair or dark. 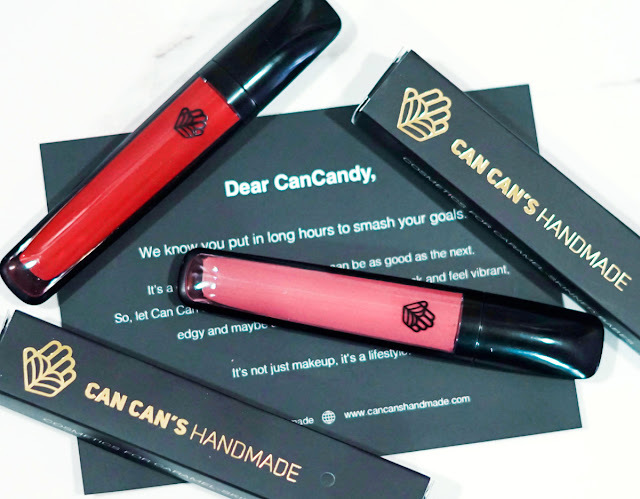 The product is said to be long-wearing, has maximum pigment and is cruelty free. Approved by the Ministry of Health Malaysia, it also consists of no parabens, no SLS, no silica and no mineral oils as well. So far after application, it looks good. 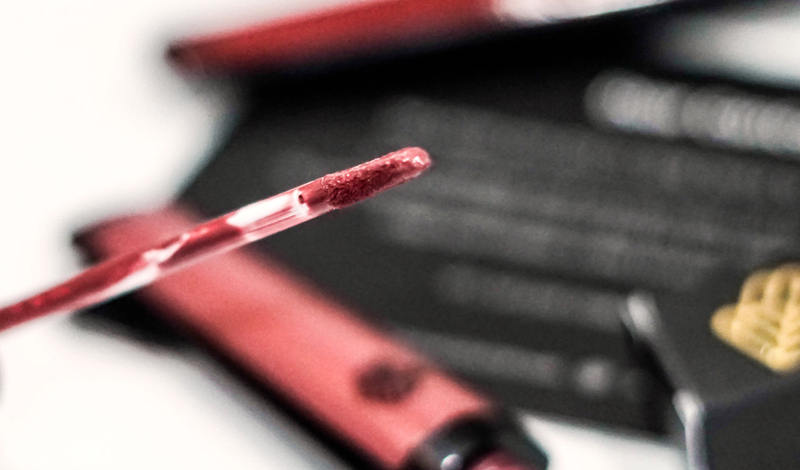 Great color with one swipe, goes well on the lip with absolutely no crease in between and is non-sticky. It does take awhile to mattify down due to its vegan formulation but it doesn't dry out the lips too much which is good; but it would be highly recommended to put a balm before hand just in case. 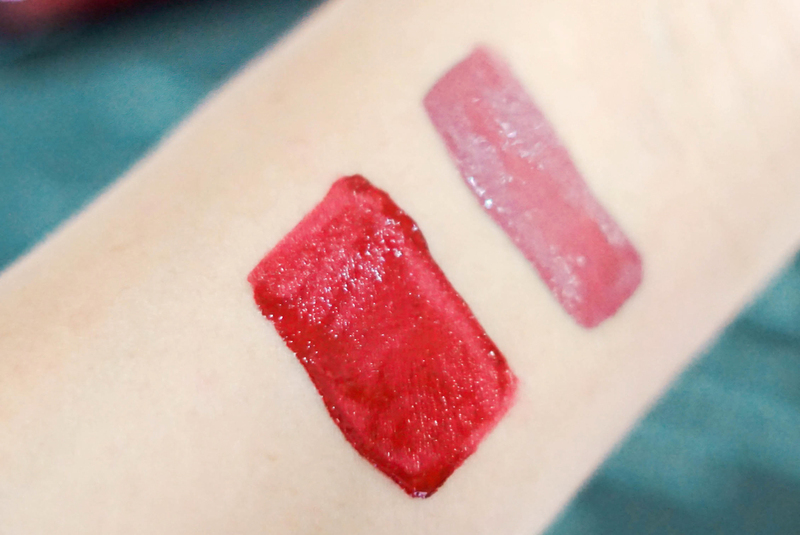 As for the long-wearing part of it, the product can go for as long as a 4 hour wear without fading, but as it is transfer proof, it does not take well to oily foods too. 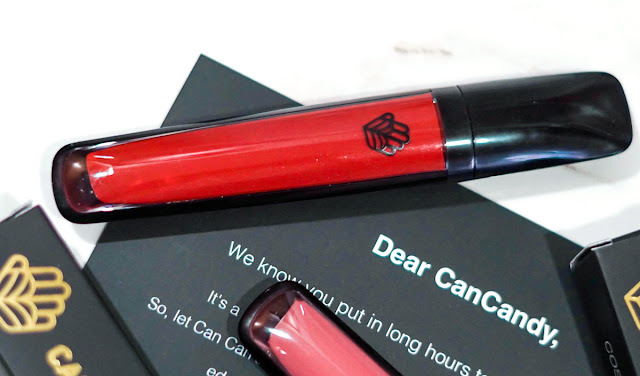 Taking a look at the first lip product launched by the brand, we have here Cherry Bomb, which is a classic vintage red. Donned on the lips, the color is extremely pretty but in terms of the application, it didn't impress as much as it took extremely long to dry down thus giving the high risk of smudging in the process. The texture is somewhat similar to its latest release, Muse but as it took longer to dry, it gave a sort of wet feeling to the lips. Noticeably, it did give small creases and a little flakiness during wear, but this is only visible upon closer inspection. Hence, if I had to make a comparison towards the formula, I would say that the improved texture on Muse was much better, while in terms of shades, both are stunning in their own way. Now you can only get Can Can's Handmade Online on their website, but for updates, you can also follow them on their Official Facebook Page as well. As for their pricing, RM69 seems to be alright, but considering that the brand first release their products at RM59 a piece in 2016 (RM49 as the initial promo a month before that), the increase seems to be a little quick when all is considered. Nonetheless, the brand does show a lot of promise, so I am certainly going to be looking forward to see what they come out in the future. Oh I so love the MUSE color. So beautiful. Although limited to just that two shades, they are really beautiful. Am looking forward to more shades soon by Can Can Handmade. What do you think of this new lippy? is it long lasting? Have not try this brand yet, the muse color looks good. I have seen Can Can's ad on my instagram. Only today I'm getting to know this product personally. It is a question on why they have only 2 colours so far since they are active since 2014. But I love the two colours anyhow. Cherry bomb looks beautiful, I hope they consider improving the formula. If it takes longer to dry, I'll worry about smudging too. I love both colours but I think most girls could get away with Muse anytime. Oh such a promising handmade brand. I'm loving the colors and the packaging. Personally going for the shade muse.